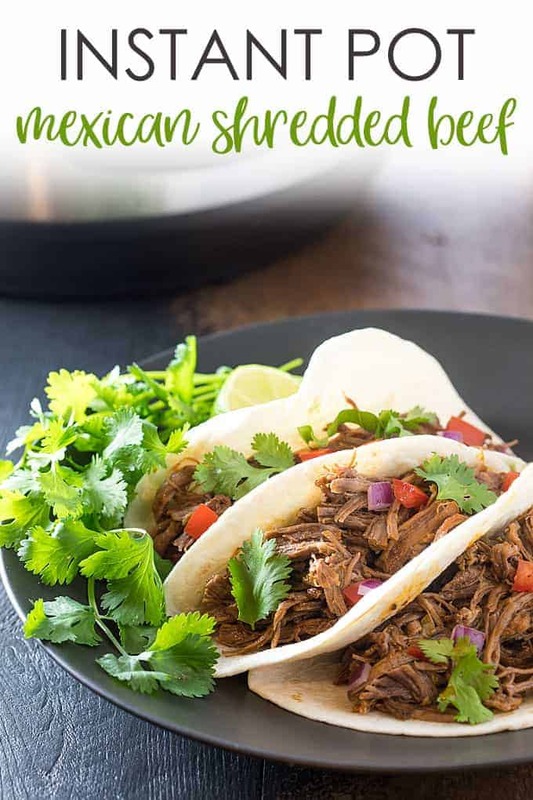 Mexican Shredded Beef has never been easier than this Instant Pot Mexican Shredded Beef… let your pressure cooker slash the time! You guys… this beef! It’s so easy to throw together for Taco Tuesdays (or any night!) in a fraction of the time of your slow cooker. 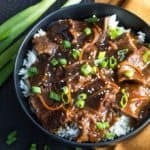 Although I love this prepared in my slow cooker as well, I have a new love for my Instant Pot and trying to make anything and everything in it that I can. I love being able to cook in a fraction of the time without sacrificing flavor or tenderness. I’ve been taking more time to go on long walks with my dog (Baby!) and enjoying my new back porch so my Instant Pot really has come in handy. 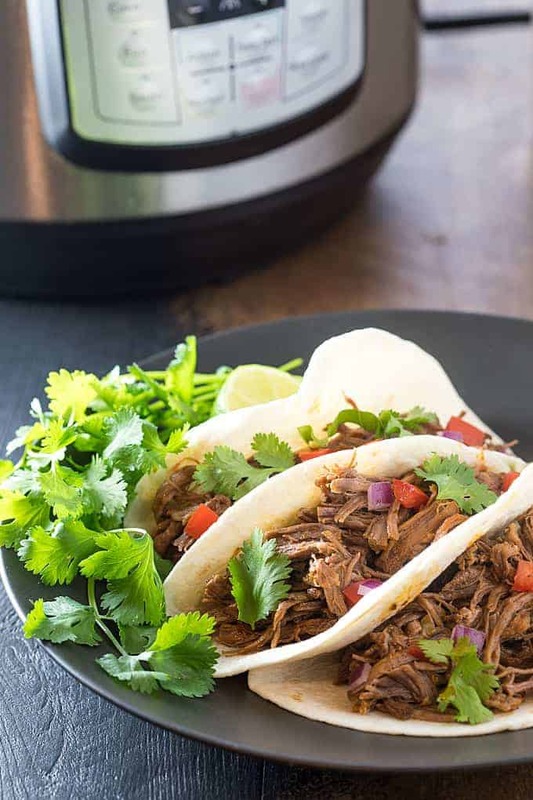 How long does this Mexican shredded beef take to cook in the Instant Pot, really?! This recipe takes a total of approximately 1 hour and 50 minutes TOTAL to cook, which includes the time it takes the pot to come to pressure (about 10 minutes), cook time and the time it takes the pressure to naturally release (about 20 minutes). What do I serve this beef with? I love to eat it on tacos with my favorite toppings… cheese, tomatoes, sour cream, onions, cilantro… I could go on and on! You can also serve it over tortilla chips and make one hefty plate of nachos. 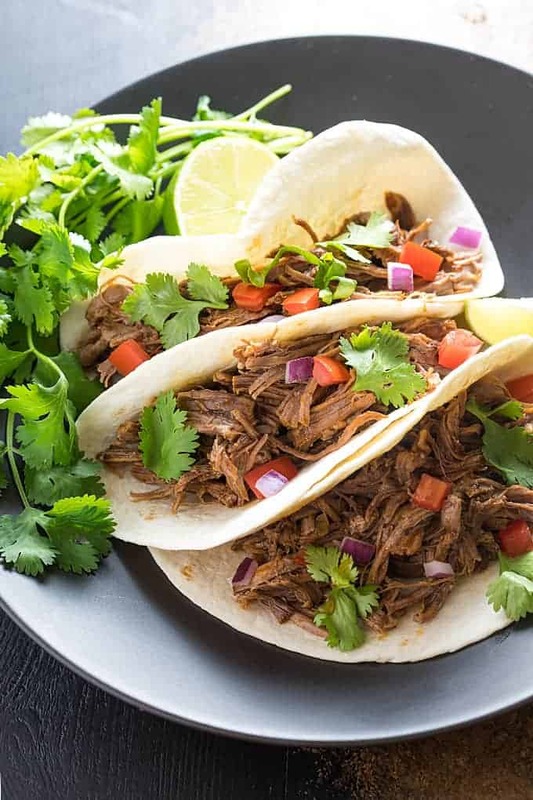 If you prefer to cook in your slow cooker, here is my recipe for Slow Cooker Mexican Shredded Beef. Enjoy! Pour beef broth in a small bowl. Add salt, pepper, cumin, chili powder, garlic powder, onion powder, paprika, oregano and crushed red pepper flakes. Whisk to combine and set aside. Pour oil into your Instant Pot and set to saute. When oil is heated, sear roast on all sides until browned. Turn off Instant Pot. Pour beef broth mixture and salsa over roast. Place the lid on pressure cooker and lock. Steam release knob should be set on “sealing”. Cook on manual setting (high pressure) for 70 minutes. Allow pressure to release naturally. Remove beef from pressure cooker and shred with 2 forks, discarding any fat. Allow fat to rise in liquid and skim off fat. Return beef to liquid mixture. 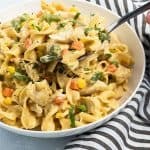 I used an Instant Pot LUX80 8 quart in this recipe. Cook time includes time it takes for pot to come to pressure and natural release time. This is delicious and SO quick and easy to make! I’ve had an instant pot for months and was afraid of the thing. Your easy to follow directions helped me to break through the crazy fear of using it. Thank you! Does it matter if my chuck roast is frozen? The timer does not start until the frozen meat thaws and gets to the correct temperature. It will take longer, but the cooking time is set at the same amount as if the meat was thawed. I appreciated the idea of making a slurry to add to the browned chuck roast – clever. How much longer did you cook it if it was frozen? 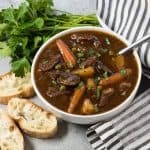 You mentioned you used an 8 quart instant pot for this recipe. Will it fit in a 6 quart instant pot? Hi Marc, I’ve only tested this recipe in an 8-quart Instant Pot so I can’t say with certainty. Here is an article on cooking differences with different sized Instant Pots that I hope will be of help. 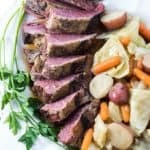 What size of roast should I use for 6 quart instant pot? How would you adjust the cook time? Thank you! Hi Nicole, I’ve only tested this recipe in an 8-quart Instant Pot so I can’t say with certainty. Here is an article on cooking differences with different sized Instant Pots that will hopefully be of help. I did it in a 6qt and it worked perfectly :). Didn’t alter the recipe at all. My new fav. Thank you! 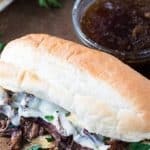 With both of your InstaPot and slow cooker recipes posted, what is the difference in taste/texture with the two methods? Prior to having a InstaPot, I would brown the roast in a cast iron skillet prior to putting it in the crockpot. With the InstaPot, browning the meat is easy, I would just would love to know the pros & cons with the two methods, since it’s just a different button on the InstaPot (and obviously different cook times). Thanks in advance for your comparison. I made this using a 1.25lb. beef chuck “steak” (I was nervous about cooking a large, expensive roast). I used the same amount of broth, but cooked it for 20 min Manual, and a 10 minute natural release (used the Instant Pot cooking times guide). I found that the “steak” cooked very much like one, and never fell apart like a roast should. 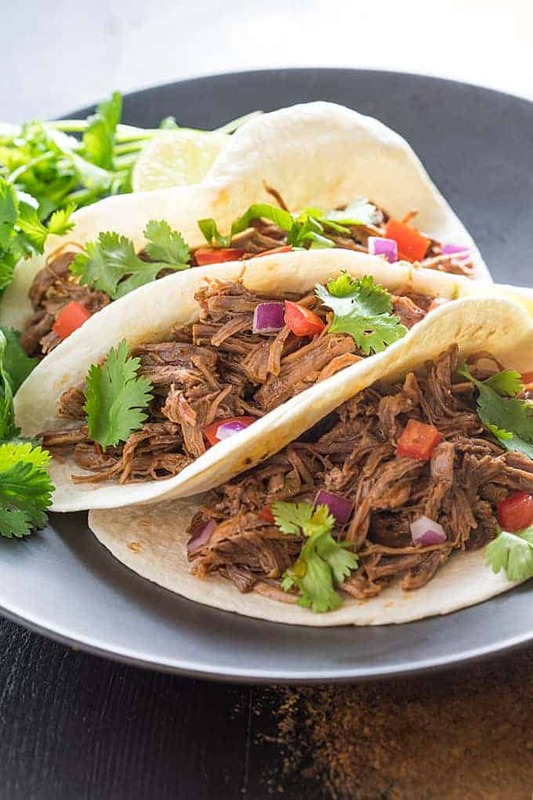 We had to work hard at shredding it for our tacos, but was tender and flavorful. The sauce was delicious and will definitely make again. Used a cornstarch slurry at the end to thicken the sauce. 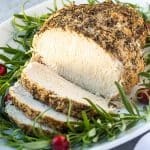 I modified this recipe for two frozen chicken breasts and it turned out delicious. I have a 6 qt instant pot. I seperated the two frozen chicken breasts in the bottom of the pot so they weren’t touching, poured 1/3 cup chicken broth over the chicken, sprinkled 1/4 teaspoon of all of the seasonings listed in your recipe evenly on top of each chicken breast, except for cumin I used 1 teaspoon, put 3/4 cup salsa verde on top of the chicken and set it for poultry 25 min. I did not use any oil. Once done, I shredded the chicken on a cutting board and placed it back in the pot with the liquid. So easy! Thanks! I made your recipe a couple of weeks ago and we loved it. I want to double the amount of meat. Do I double everything? What about time? Thanks! I doubled everything. I did cut out any big chunks of fat in the 2 roasts and I ended up cutting them up in 6 fairly equal size pieces. I put a little of the broth on the bottom to loosen up the brown bits from the searing. I then put 3 chunks of meat in the instant pot, poured 1/2 the broth mixture and 1/2 the salsa. I then placed the remaing 3 chunks of meat on top and pored the remaining cup of broth mixture and cup of salsa, used the same timing. It was delicious! All of my family raved about it! And I have a little left overs! Does “manual setting” just mean Pressure Cook? On the newer versions there isn’t a manual setting. 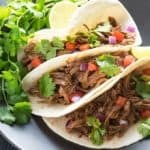 Can I make this recipe in a slow cooker? Me and mi wife love this, do u know the nutrition facts for this recipe? Hi Eddy, So happy you and your wife love the shredded beef! I currently do not have nutritional info, but in the meantime you can search for “nutritional calculator” online and there are several resources that will calculate it by entering the ingredients.